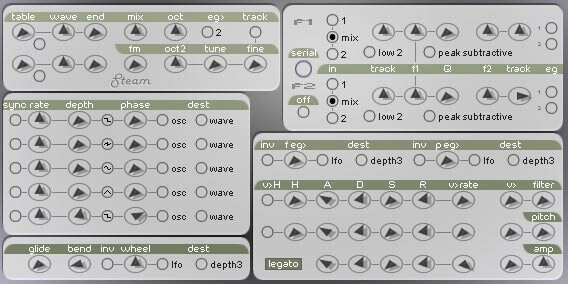 Steam uses prepared wav files in a similar manner to some Waldorf and Ensoniq synthesizers. I have been told that the header data for the wav files is written incorrectly (perhaps due to the free wav editor I used) which produces clicks during modulation. I would prefer not to offer this VST, for some reason it seems to be popular. To make Steam work, you MUST download Steamwaves and place the wavefiles into the “steam” folder that contains the “steam.txt” file, this is created automatically at first run. But, depending your system, this might not work, you’ll have then to edit this txt file by putting by hand the waves locations like this “..steamsteam00.wav; “… Worth a try !